One of the most versatile multifunction units for workgroups, the Panasonic KX-FLB801E offers an entire feature set to meet your office's needs. This device prints, scans, copies, and faxes and offers many other functions to make sure you can flexibly handle your documents. The Panasonic KX-FLB801E printer integrates well with your workflow, thanks to its convenient functions and features. However, the device is quite expensive to manage, as it uses extra-yield cartridges. The Panasonic KX-FLB801E printer, scanner, copier, and fax machine is relatively compact. It combines several office machines in one and has a very convenient design and layout for easy use. It has an easy-to-use scanner unit, which also doubles as a digital copier. Digitized documents can be transformed to editable text and can even be sent as an email attachment or saved to a network folder or PC. The Panasonic KX-FLB801E is a good choice for any professional workgroup. 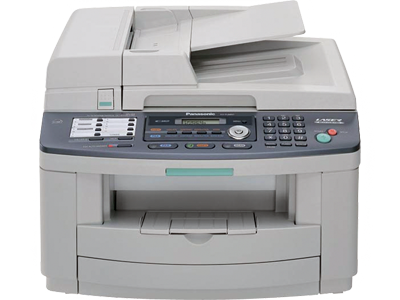 It features its own automatic document feeder, which makes multiple-page scanning and copying a lot easier. Received fax messages may even be saved to file instead of being printed to save on paper and keep records of documents much easier. The Panasonic KX-FLB801E offers excellent value for workgroups, although it might me impractical for personal or household use. The device uses extra high capacity cartridges, which can be quite costly especially when you use your Panasonic KX-FLB801E for regular document production and bulk print work. Nevertheless, this device is a good choice for demanding office environments in need of an all-in-one device.